The Okhotsk plate is located on the Western side of Asia, primarily under the Okhotsk Sea, but also the Kamatchka Peninsula, Sakhalin Island, and Northern half of Japan. It was considered part of the North American plate, but recent research has shown that it moves independently and can be considered a separate plate (Sakurai et al. 2006). The boundary between the North American and Okhotsk plate is the Ulakhan Fault, which is transform in nature, specifically left-lateral (or sinistral). The most Western section of this fault is connected to a triple junction between the North American, Eurasian, and Okhotsk plate where it is being compressed by the 2 former plates, producing a more complicated setting. This NW section of the plate is thought to be broken up by multiple NW-SE trending strike slip faults which break the area up into multiple faulting blocks (Hindle et al. 2009). While the overall motion of the plate is 1.5cm/year SW, it also has a rotational component. Research shows that the Okhotsk Plate rotates 0.231deg/Myr clockwise about a pole located to the North of Salkhalin Island. The OKH plate is bordered on the south-west by the Amurian plate and north-west by the Eurasian, which are also rotating (at about 0.298deg/Myr and 0.237deg/Myr respectively) but in the counterclockwise direction (Apel et al. 2006). 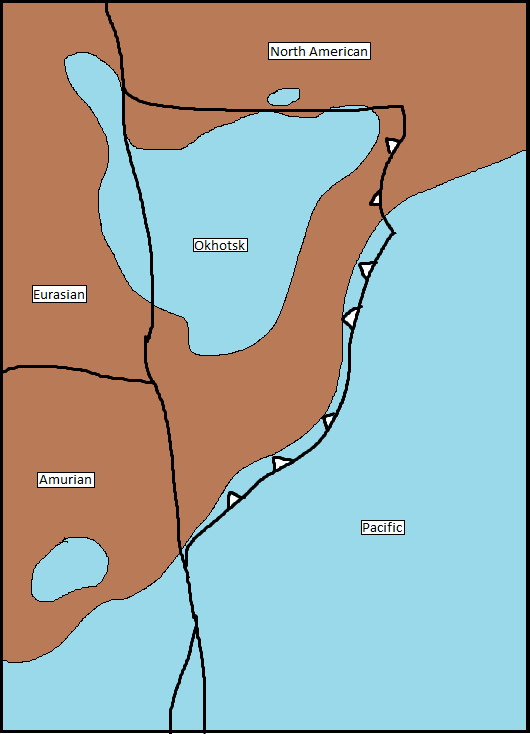 The result is a rifting boundary to the north (between EU and OKH) and a converging boundary to the south (between AMU and OKH). The overall motional trend of the plate is approximately 1.5cm/year in the WSW direction, considerably slower than the Pacific plate to its west, which is moving at ~9cm/year. As a result, the boundary between these two plates is a large subduction zone. This subduction zone has been responsible for numerous high magnitude earthquakes, most famously the Tohoku Earthquake of 2011. For more information on earthquakes in Southwest Asia, take a look at the Natural Hazards page. For a similar plate scenario, look at the tectonics in the Southwestern Pacific. A zone of interest in the Okhotsk plate is the Kamchatka Peninsula. Subduction of the Pacific plate deep into the mantle (Jiang et al. 2009) produces large quantities of melt, resulting in an intense zone of volcanism above. The area is host to over 150 volcanoes, 29 of which are still active, the highest being Klyuchevskaya Sopka, which is the largest active volcano in the northern hemisphere. Along the transform plate boundary to the north, we can expect to see an elongation of preexisting features. The small peninsula crossing the fault will be dragged along, making it longer and potentially turning it into an island or series of islands. The rift boundary caused by rotation in opposite directions of the Eurasian and Okhotsk plates will open a valley, decreasing the elevation of the land and allowing the Okhotsk Sea to move further inland. 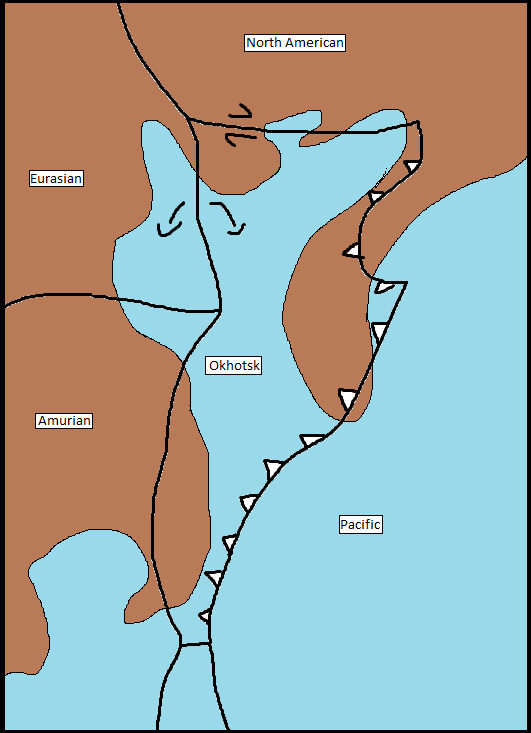 Along the same boundary line to the south, the Amurian and Okhotsk plates converge. Coupled with the subduction to the east by the Pacific plate, there will likely be increased volcanism and continental uplift in the waters between Japan and China. This will produce new land, causing the oceans to recede and Japan to join the rest of continental Asia. As volcanism continues along the Pacific-Okhotsk boundary, the Okhotsk Sea could become completely land-locked and begin migrating further and further to the northwest as Eurasian-Okhotsk plate rifting continues. 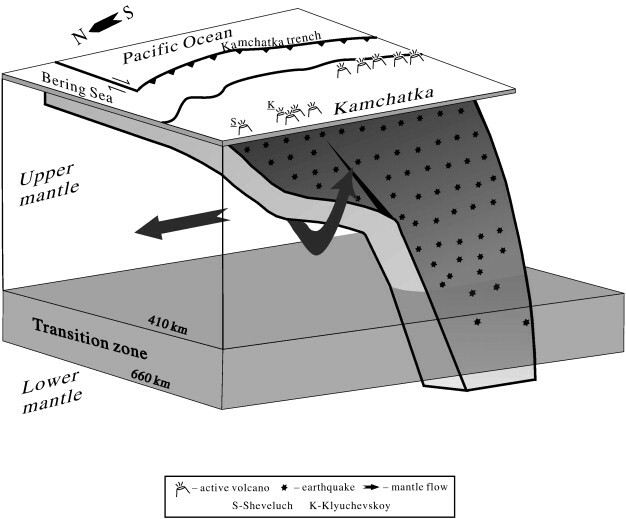 D. Hindle, K. Fujita, and K. Mackey (2006), Current deformation rates and extrusion of the northwestern Okhotsk plate, northeast Russia, Geophysical Research Letters, VOL. 33, L02306, doi:10.1029/2005GL024814. Apel, E. V., R. Bürgmann, G. Steblov, N. Vasilenko, R. King, and A. Prytkov (2006), Independent active microplate tectonics of northeast Asia from GPS velocities and block modeling, Geophys. Res. Lett., 33, L11303, doi:10.1029/2006GL026077. Seno, T., T. Sakurai, and S. Stein (1996), Can the Okhotsk Plate be discriminated from the North American plate?, J. Geophys. Res., 101(B5), 11305–11315, doi:10.1029/96JB00532. Sokolov, S.D., Accretion tectonics of the Koryak-Chukchi segment of the Pacific belt [in Russian], 187 pp.,Nauka, Moscow, 1992. Page and drawings created by Matthew Simons. Last edited Jan. 30, 2014.